Opposition activist Navalny gets 3.5-year suspended sentence in Yves Rocher case | Russian Legal Information Agency (RAPSI). MOSCOW, December 30 (RAPSI) – Opposition activist Alexei Navalny on Tuesday received suspended sentence of 3.5 years in the Yves Rocher embezzlement case, RAPSI reports from Moscow's Zamoskvoretsky District Court. His brother Oleg was sentenced to 3.5 years in prison, fined 500,000 rubles (about $8,600). The court also ordered the brothers to pay out 4.4 million rubles (about $76,000) to the Multidisciplinary Processing Company which claimed damage. Alexei Navalny will remain under house arrest until this court ruling takes effect. Prosecutors have asked the court to sentence Alexei Navalny and his brother Oleg to ten and eight years in prison respectively. The state prosecution told RAPSI that it was yet undecided on appealing the sentence for Navalny brothers, as the judge has yet to read the full text of the verdict. 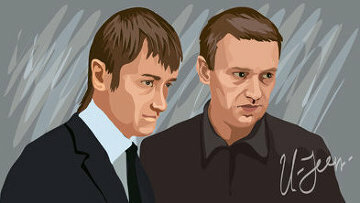 Lawyers for the Navalny brothers vow to appeal against the sentence. Oleg Navalny was detained by court bailiffs after the sentencing, to prepare processing for a general security prison. Navalny and his brother Oleg stand accused in a fraud case involving cosmetics company Yves Rocher Vostok. Investigators allege that the Navalny brothers embezzled up to 26 million rubles (about $457,700) from the cosmetics company, as well as close to 4 million rubles ($70,600) from the Multidisciplinary Processing Company by way of a fraud scheme. The brothers were further charged with having laundered 21 million rubles ($370,500). Alexei Navalny has been already given a suspended sentence of five years for the embezzlement of funds from Kirovles Company. 09:59 30/12/2014 Opposition activist Alexei Navalny on Tuesday received suspended sentence of 3.5 years in the Yves Rocher embezzlement case.